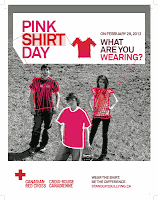 On Wednesday, February 29th, 2012 - WEAR a pink T-SHIRT to stand up to Bullying. Wear the shirt. Be the difference. For more information, visit www.standup2bullying.ca or Ridge Respect. By the Safe School Action Team (SSAT).